James Halliday, the founder of the OASIS, a virtual reality world where most people work and play in 2042, has died. He has left his entire fortune and control of the game to whoever finds an Easter egg he has hidden within the virtual world. They must work their way through clues and challenges to reach the final reward. Wade, known as Parzival in the OASIS, is determined to find the egg, along with hordes of other gunters (regular people participating in the hunt). But there's also a company that will do just about anything to beat them and take control of the OASIS. Ready Player One by Ernest Cline is a cool combination of futuristic world and 1980s pop culture. Halliday loved the 80's, so everything about the hunt revolves around the games, movies and music of that time. As someone who was born the same year as Halliday, it was a lot of fun to relive the details of my childhood through the eyes of my future grandchildren! This is a fast-paced novel with lots of suspense and excitement as Wade and the others figure out the different clues Halliday left behind, and race to beat each other to the finish line. Among the constant action is a deeper story of the people who are so immersed in this virtual world and the reasons for their obsession with the OASIS. This seemed frighteningly real. I loved all of the characters and the depth that Cline went into about each one without taking away from the pop culture fun and the thrilling race. 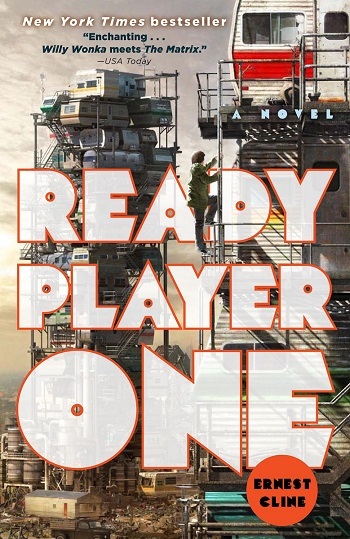 I would highly recommend Ready Player One to anyone who is looking for a thrilling adventure ride, but especially to anyone who is interested in 80's culture, or perhaps lived through it as I did. You don't have to be obsessed with video games, either. I certainly am not! This review was written based on a copy of Ready Player One that I purchased. This post includes Amazon Affiliate links. If you purchase something using my link, I will receive a very small commission but your price does not change. So glad you loved it, too! I felt just the same way you did - I am by no means into video games, but he crafted a suspenseful story with plenty of emotional depth...and i loved the 80's pop culture references, too! I had so much fun reading this book - did you hear they are making a movie? I can't wait! I can't wait for the movie! It has a lot of potential with this storyline!